I just wrote a short article on NothingButSharePoint.com about the SharePoint Form Web Part. Also, I’m in the process of writing a 3 part series for NothingButSharePoint.com about SharePoint for Nonprofits. My aim is to point out how associations and nonprofits are successfully using the platform and what they are using it for. If you haven’t already heard the buzz around Sharing The Point: Asia 2011, here you go! It’s a series of free, half-day SharePoint events which will take place in three Asian countries this March (Beijing – China, Manila – Philippines, and Ho Chi Minh City – Vietnam). Think ½ day Asian edition of SharePoint Saturday. Speakers include SharePoint evangelists Joel Oleson, Michael Noel, Paul Swider, Mark Miller, Rob LaMear and Dux Raymond Sy. Each presenter will provide sessions on real-world SharePoint experiences, lessons learned, best practices, and general knowledge to attendees. What if one of the very best SharePoint Design experts offered one hour of walking you through the secrets of making SharePoint look & feel exactly how you wanted it – would you pay attention? Okay, what if several of the very best SharePoint Design experts all got together for a full day to walk you through all their tricks, best practices, avoidable pitfalls and trade secretes – would you show up? Making SharePoint look and feel precisely the way you want is an art form, like taming a wild horse – but if you can do it, you are in HIGH-DEMAND. These guys are extremely sought-after and hard to gain access to. The industries top SharePoint Design experts are gathering at the upcoming SharePointConference.ORG conference in Baltimore. You don’t want to miss this one – this type of gathering just doesn’t happen often. These SharePoint Design “horse-whispers” have combined decades of experience to share with you. The conference also has a SharePoint Business User Track, and a SharePoint Developer Track. I’ve been generously provided a 10% discount code which works for a limited number of seats. I’ll take it down when it’s depleted. No way I’m missing this one – and really hope to see you there. We did the SharePoint 2010 Talk Radio interview this morning with Gary Vaughan. …used for intranets, extranets, public websites, communities of practice. Why might an organization want to migrate to SP 2010….or why not? TheSUG.org is an online SharePoint User Group, which also runs on the SharePoint platform. By joining TheSUG.org, you can participate in online discussions about SharePoint, ask SharePoint related questions, and find SharePoint related information. You can also lookup or add SharePoint terms in our SharePoint wiki, and host your SharePoint blog here. LinkedIn’s largest SharePoint community! Created on February 25, 2008 for Professionals. The group welcomes anyone interested in SharePoint, whether you are a beginner or an expert. Tell a friend to join now and start connecting! We only have two rules: NO RECRUITERS and NO JOB POSTINGS. Dozens of authors are committed to providing content on a daily basis to each area of the site: End User, IT Pro, Developer, Business. Content on the site is created by contributing authors as well as members of the SharePoint Community. All members of the SharePoint Community are encouraged to submit articles, no matter what their level of expertise. What are you doing this Friday morning? Want to make the morning commute a little more meaningful? I’ll be speaking with Gary Vaughan this Friday morning on blogtalkradio to discuss SharePoint 2010. Specifically, some of the best new features and how organizations are leveraging 2010 capabilities. Gary’s interviews are always very interactive and you are encouraged to ask questions at the end so the SharePoint community can benefit. Hopefully you can join us Friday morning 2/4/11 at 8:00 AM EST. To listen in, just call the below Call-in Number Friday morning at 8 AM. …hope you can make it! SharePoint for Nonprofits – Our book is finally complete and available! I would first like to thank Jim LaRocca, my friend and SusQtech Vice President, for mentoring me, putting up with my shenanigans, and teaching me many, many things – perhaps the most important of which is putting myself in other peoples shoes! Thank you Jim. SharePoint for Nonprofits addresses the specific needs of trade associations, membership societies, voluntary organizations, and other nonprofit associations, charities and .orgs; and how SharePoint might be used to satisfy some of these needs. This book is NOT about installing SharePoint or writing code. SharePoint for Nonprofits is about strategy, best practices and how organizations of all sizes leverage Microsoft’s popular SharePoint platform. It is my hope that by reading this book, you will understand what can and can’t be accomplished using SharePoint, and how to best approach SharePoint solutions. This book aims squarely at providing high-level SharePoint guidance and approach techniques for associations, nonprofits and orgs of all sizes. SharePoint for Nonprofits will help you properly navigate your org through the breadth and depth of SharePoint’s many, many uses. “Despite the maturity of the Microsoft SharePoint platform, there is still a lot of misinformation in the marketplace about its capabilities. 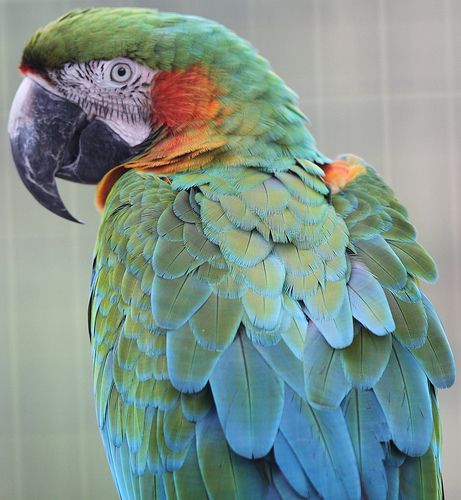 Talk to a dozen vendors and you will get at least a half a dozen different answers. This book brings clarity to many of the misnomers that have been circling the SharePoint world. It sheds light on a number of areas that many SharePoint consultants have neglected for far too long. No longer does SharePoint need to be relegated to the back of the house for intranet or document management. John and Sean go to great lengths to explain how SharePoint should be viewed as a platform, not just a document repository. A quick and easy read, this book is concise and provides sound guidance as to the opportunities as well as pitfalls related to implementation and customization of SharePoint. It provides well thought out approaches and discusses the little known and talked about potential of an integrated SharePoint system/platform. This is not a developers guide, it is a book written specifically to IT decision makers, strategists, and executives. SharePoint for Nonprofits is now available for purchase. I hope you enjoy our best-selling book ever (mainly because it’s also our only book ever 😉 I’m very much looking forward to seeing you guys out in the awesome SharePoint community! 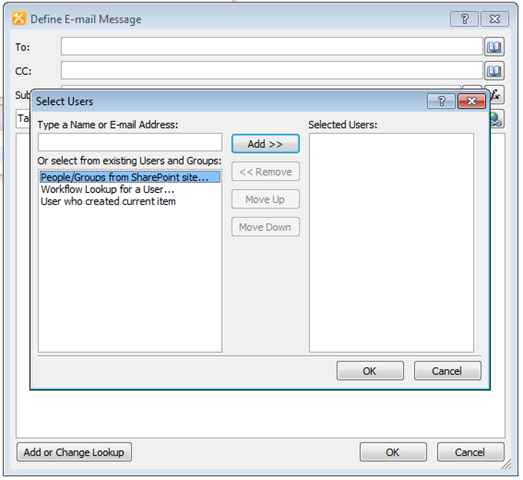 MS Office Web Apps – Do end users still need MS Office installed on their workstations? 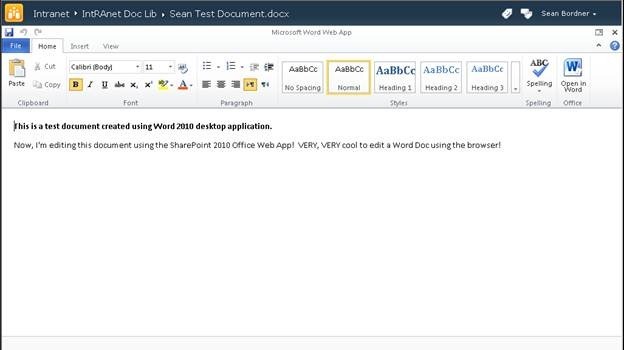 Office Web Applications give you the ability to run Microsoft Office applications such as MS Word, MS Excel and MS PowerPoint from within the web browser. 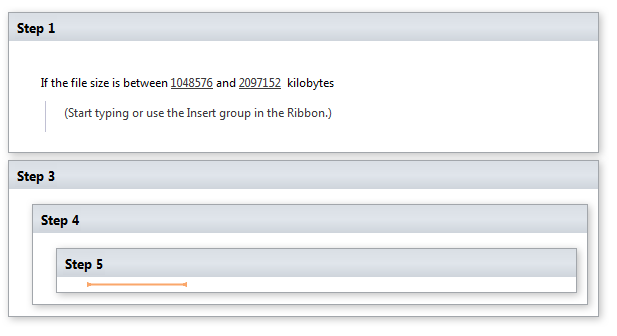 A SharePoint 2010 Server makes this all possible. SP 2010 will need to be configured to run the Office Web Apps first (a post for another day). To answer the original question of whether or not end users even need MS Office installed on their workstations anymore – it really depends on the end user and what they will actually be doing. 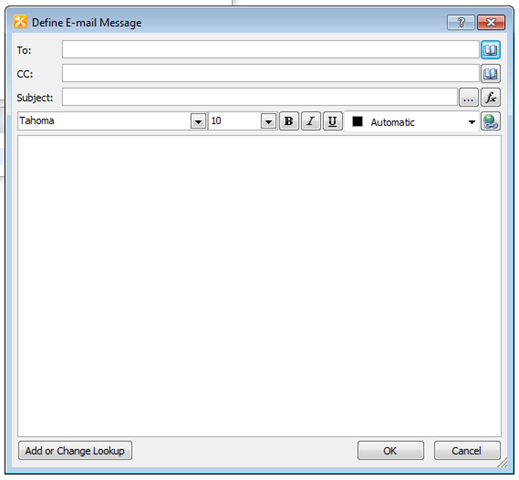 To clarify, let me start out by explaining that the features available with Office Web Apps are slightly watered down. I would venture to guess that in most cases end users won’t miss the missing features; however, I do recommend performing a quick MS Office usage analysis to determine who still needs MS Office running on their workstations, and who doesn’t. Keep in mind that since Office Web Applications are available via a web site (Intranet for example), end users will obviously need internet connectivity to work with MS Word, MS Excel and MS PowerPoint (a potential show stopper for some which require employees to work after hours and away from the office in situations where connectivity is not guaranteed). Let’s take a look. 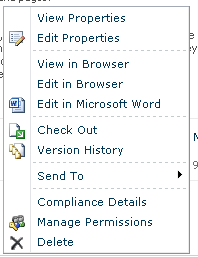 Here’s a SharePoint 2010 Document Library containing one file. Notice the “Edit in Browser” option? This is only available with MS Office Web Apps. Now I can simply edit the document just like I would using the MS Word desktop application on my workstation, but I’m doing it in my browser! The look/feel is basically the same. Here’s a closer look at the ribbon interfaces, look familiar? This same ability is available for MS Excel as well as MS PowerPoint. I think this has a lot of potential and suddenly we have some interesting choices to make! It’s worth playing around with to see what you think. Using SharePoint Designer 2010 to create sophisticated reusable workflows is so easy, even a… Let’s just say it’s pretty easy. This post aims to walk you through the steps of creating a reusable workflow in SharePoint Designer 2010 and point out some pretty cool things as we go. First of all, when would you bother using SharePoint Designer 2010 to create a workflow, vs. just using the SharePoint 2010 provided browser interface? Well, that’s an easy one – the answer is: You would use SharePoint Designer 2010 to create a workflow when the workflow you wish to create involves conditions and is NOT as simple as just a basic review/approve process. 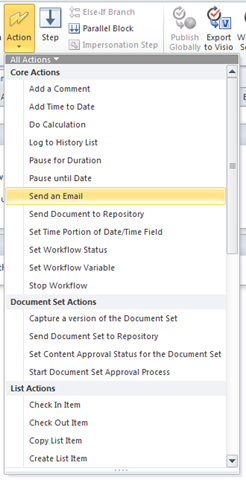 Here are the steps involved in creating a reusable workflow using SharePoint Designer 2010. 1. 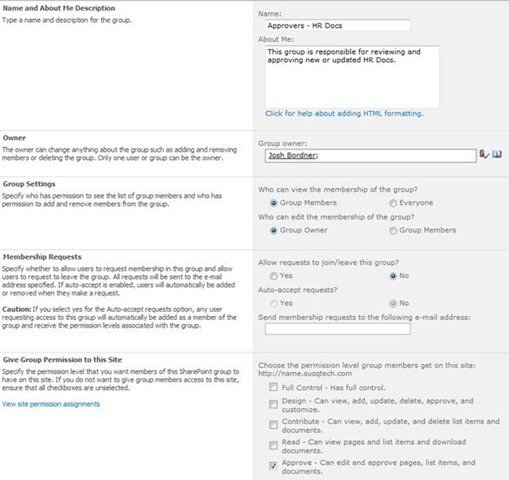 Create your new approvers group and populate it with the desired users. 3. Once the site is opened in SharePoint Designer 2010, you can create a new workflow by selecting File/Add Item/Reusable Workflow. Choose reusable workflow if you wish to use this same process in other areas. 4. Provide a meaningful name to your new workflow, and select the appropriate content type. For this example, we will name it “Josh and Jim Approval” and use the “Document” content type. 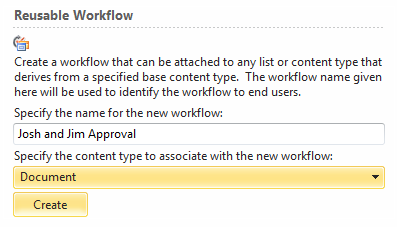 Provide meaningful workflow name and specify the appropriate content type, click the “Create” button. 5. 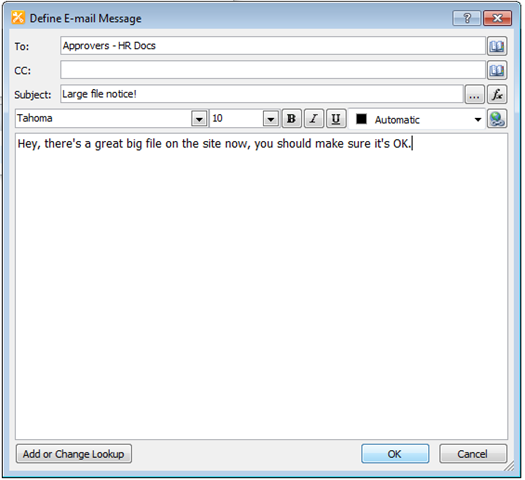 You may receive the following pop up dialogue in SharePoint Designer 2010, just let it do its thing. 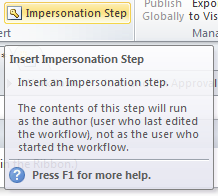 Note: One pretty cool feature is the ability to insert an “Impersonation Step.” The contents of an impersonation step will run as the auther, not as the user who started the workflow. 7. For this example, let’s say we want Josh and Jim to be notified when large files are uploaded to the site. 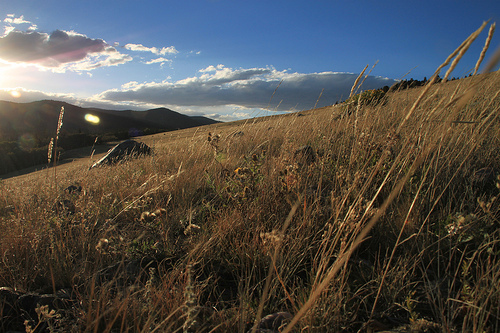 We will start by defining the condition which triggers the workflow, and then we will specify the corresponding action. 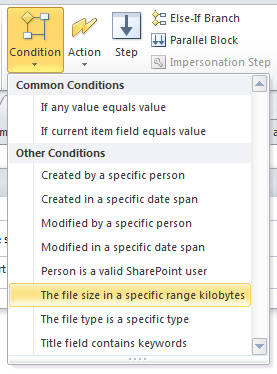 Since we want to fire off this workflow when a large file is uploaded, we will select “The file size in a specific range kilobytes” condition from the dropdown. 8. This site is configured to reject files larger than 2GB, so we will specify a file size range between 1-2GB, which will catch all files 1GB and larger in size. 9. Now we specify the action. For this, we need to insert a new step. 10. Select “Send an email” for this action. Click the Lookup book icon to the right of the “To” field so we can locate the approvers group we created earlier. 14. 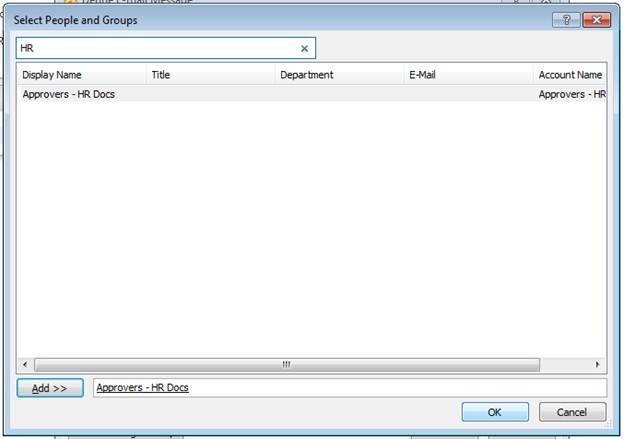 The below dialog pops up, if you know all or part of the group you want to use, type it in the search box and click the search button, select the correct group in the results (in the example, it’s “Approvers – HR Docs”), but it could be any group you wish. Click the “OK” button. 15. Click the “OK” button for all dialogs until you are back to the orginial one. Specify the Subject, and Body of the email. 16. Click the “Publish” button in the ribbon and you are done! 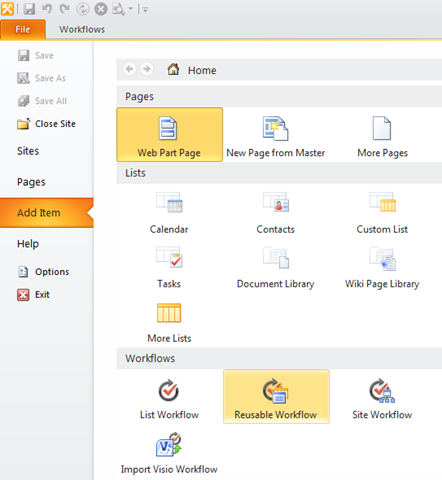 Now you have a workflow which was created using SharePoint Designer 2010 and is also reusable (not possible with previous versions of SharePoint. Again, this was a very, very basic kinda situation, but you should get the point. 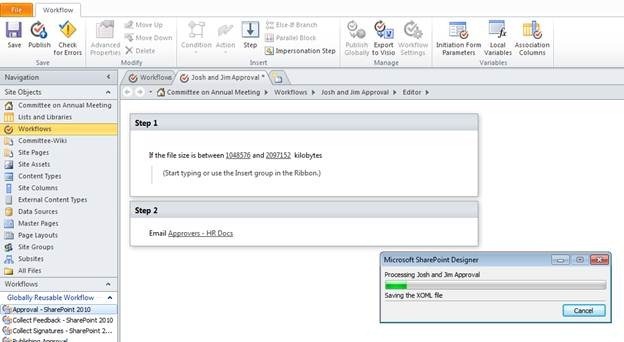 It’s super easy to create workflows using SharePoint Designer 2010, including pretty sophisticated ones. 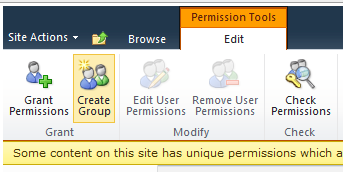 Have fun playing around with this and don’t forget to share your experiences with the SharePoint community! 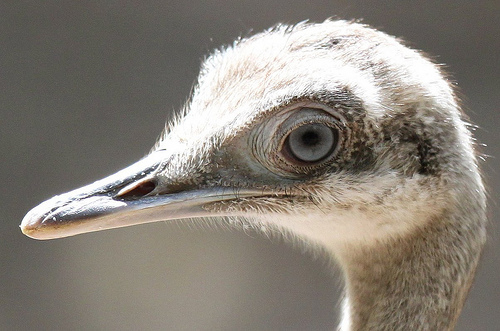 Snippets are the little descriptions displayed about the link on search results pages. For a long time now, snippets have been auto-generated by Google and you had little control over what the snippet would be – other than the fact that it’s mined from the page it’s referring to. Enter Rich Snippets! Rich Snippets allow you, the content owner, to specify the snippet language. It’s a way of adding some structure to unstructured data. Snippets can currently be applied to people and to product reviews, more types coming later on. Note: This is from a great little article on CMSWire entitled “New Google Tech Fuses SEO and Semantic Web”. With microformats, you specify that you’re defining a person with contact information with the term “vcard.” You use the div and span tags to logically group the information, with div used for multiple pieces of information and span used for single pieces of information. The opportunity here would be to automate this in SharePoint so whenever snippet compatible content types are used, they are automatically rendered in either microformats or RDFa. For example, the “Product Review” content type. This would be a prime candidate for yet another thing in SharePoint which can be automated to help the SEO cause! From time to time I have to troubleshoot SharePoint Search Engine issues dealing with it not properly indexing some external web site. Just thought I’d share the steps I typically take in case you are trying to figure out what might be causing the problem. I find it helpful to isolate where the problem is before doing anything else. Here’s how I approach determining where the problem is. The first thing I do is make sure the SharePoint Search Engine is working, period. Is it at lease indexing the SharePoint site properly? If not, it’s pretty obvious the problem is with the search engine configuration, or at least something on the SharePoint side of the street, including the network it lives on. However, if it’s not having any problems indexing the SharePoint site, I move on and see if it is (or will) index any other external web sites properly. The ‘spider view’ of the page you have configured your SharePoint Search Engine content source to start from is the best place to start. Paste the URL into the spider-simulator and let it rip. If it can’t crawl the page, you have found the problem. If it can crawl the page, carefully check the results. 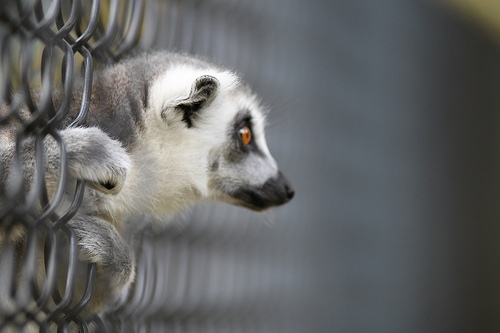 Examine the internal links as well as the external links. This is when you will find out if what your browser sees is the same as what the spider sees. Copy a link out and paste it your browser address bar and see if it loads. If you get a 404, the problem is with the links on the start page using some type of black-arts to be handled by the application which is preventing search engines from crawling properly. By now I have usually pin-pointed the problem and can begin taking steps to resolve it. Resolution steps include pointing to a different start page from within my content source, or re-writing the start page with clean HTML, or ensuring the security on the external site is not preventing a crawl, etc… You get the point, but the important thing is we have quickly isolated where the problem is before we started fixing it.